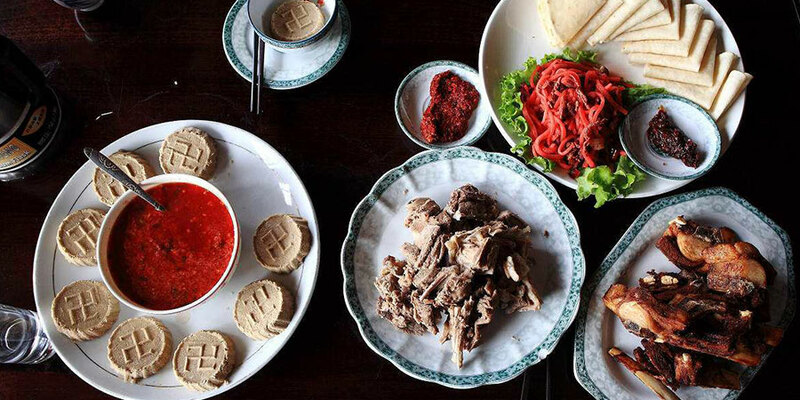 Until you find it hard to stop placing your fingers on scrumptious Tibetan cuisines, few would believe your Tibet tour actually turns out to be a blessing for the foodies. Indeed, too many, speaking of Tibet, the typical image that pops into one’s mind would be Himalayan peaks, deep blue sky, and mysterious Buddhist monasteries, and devout local Tibetans. Besides, the extreme altitude, thin air, and harsh alpine climate in the vast untouched wilderness make it even more difficult for people to associate Tibet with an ideal destination for a culinary tour. Nevertheless, as you travel in Tibet, you may be surprised to find that the reality is quite the opposite. Due to the proximity to Nepal, and India and trade with neighboring provinces in inland China, a melting pot of culinary culture can be found in Tibet, esp. in its capital city-Lhasa. 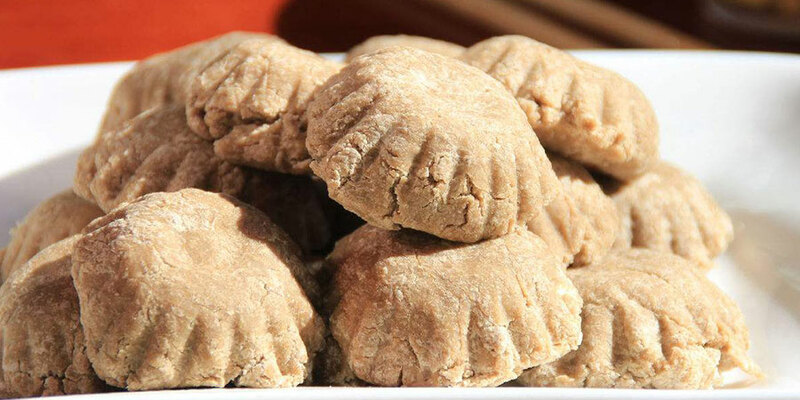 Not only can you enjoy traditional Tibetan dishes, Nepali, Indian and western and Chinese cuisines are also readily available in Lhasa and parts of Shigatse. And for centuries, the resourceful local Tibetans have used ingenious ways to adapt themselves to the inhospitable environment on Tibetan plateau. They grow highland barley that is resilient to tough alpine climate, raise Tibetan yaks and sheep to provide major source of calories in their daily diet and make full use of ingredients available to create the staple food like Tsampa, roasted-barley flour and popular beverage, such as salty yak butter tea, sweet tea, home-made barley wine, popular Lhasa beer with refreshing barley malt flavor, and plenty of tasty snacks like Tibetan yogurt, Tibetan pastry, etc. So, as you visit Tibet, in addition to the second-to-none lofty peaks, turquoise alpine lakes and magnificent Buddhist sites, Tibet will embrace each visitor with a special culinary treat. As the most reliable Tibet tour operator in Lhasa for over 10 years, our seasoned Tibetan guides know precisely how to blend your day-to-day tour with a fine exploration of Tibet via its unique cuisines. Let’s find out what for foodies to expect for your Tibet tour. 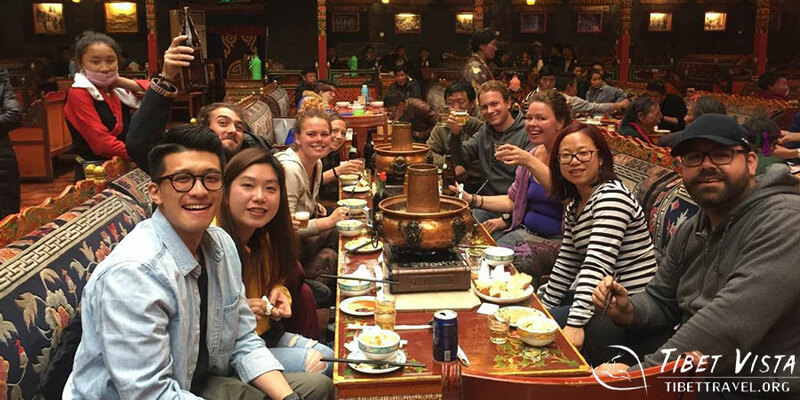 Whether you join our group tour or private tour, do not miss the culinary experience in a sweet tea house in downtown Lhasa. Sit with our Tibetan guide on a long bench and place 8 CNY on your table, the waitress will come quietly to your side and fill the cup with delicious sweet tea.